Steven Bieda, co-chair of the Schlag Memorial Commission, legal counsel for MSNS and designer of the reverse of the 1992 Olympic Half Dollar announced the sale of twenty silver proof and uncirculated sets featuring the original design for the Jefferson Five Cent coin by Felix Schlag, designer of the 1938 Jefferson Nickel. The special coins, struck by the Gallery Mint and originally commissioned by the Full Steps Nickel Club which has donated the specimens to the Gravestone Memorial efforts, feature the familiar profile of Thomas Jefferson but with the same lettering style submitted by Schlag in 1938. The reverse is the dramatic, but ultimately not utilized three-quarter view of Monticello. The special nickels are being offered in two coin sets for $150.00 postpaid. The only twenty sets consisting of one proof and one uncirculated coin will be specially encapsulated by SEGS with the words "Gravestone Memorial." Purchasers of the sets will also receive a special certificate acknowledging their contribution to the memorial. The commission is raising funds for the erection of a monument to be set at the foot of the gravesite of Felix and Ethel Schlag at Oak Hill Cemetery in Owosso, Michigan. The granite marker is of the same granite as the existing headstone, but will include information about the design of the Jefferson Five Cent coin as well as a depiction of both the reverse and obverse of the 1938 (first year issue) Five Cent piece. Bieda designed the marker. Felix Schlag won an open design competition for the design of the Jefferson Five Cent coin while living and working in Chicago in 1937. Several years later he moved to Michigan where he lived and worked as a professional photographer and sculptor until he died on March 9, 1974. "I was somewhat surprised at the number of individuals who have contacted me since I undertook this project," said Bieda, "A large number were long-time or former residents of Owosso, many of whom reported that Felix took either their High School graduation or Marriage photos." "I also have heard from a number of collectors who reported knowing Schlag in the 1960s" said Bieda. The co-chair of the project, Al Bobrofsky recounts befriending Schlag at a coin show in the early 1960s. "Felix came to the show with his right hand all bandaged up and carrying a number of autographed commemorative cards depicting "his" design for the Jefferson Nickel which he was selling for something like $3.00 to $5.00." The meeting marked the beginning of a lifelong friendship that ended with the artist's death in 1974, and his widow's death nearly twenty years later. In addition to the special granite marker, new landscaping is planned for the gravesite. Several old yew bushes that were planted in the early 1970s were removed, and the area is being graded and leveled. New landscaping has been installed along with the installation of the memorial marker. Any funds remaining after the stone and landscaping is completed will be used for a perpetual maintenance fund for the gravesite and for programs offered by MSNS designed for young numismatists. Steve Bieda initially brought up the idea for the project at an MSNS Board meeting in 2004. It became a collaborative effort with Al Bobrofsky and the two sought the endorsement and approval of the Michigan State Numismatic Society in 2004. According to Bieda, "I looked at it as a way of both honoring the designer of one of our most abundantly produced coins, of noting a special Michigan connection with our circulating coinage and as a special way of commemorating the fiftieth anniversary of the Michigan State Numismatic Society." Individuals interested in buying the special two coin set can make checks payable to: "Al Bobrosky/Schlag Memorial," and sent to Michigan State Numismatic Society, P.O. Box 87931, Canton, MI 48187. Individuals interested in just making a contribution can utilize the same address. Contributions of $25 or more will be recognized with a special certificate. 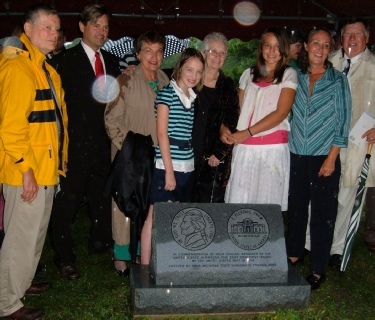 Steven Bieda, legal counsel for MSNS and designer of the reverse of the 1992 Olympic Half Dollar announced that the memorial stone to Felix Schlag, designer of the 1938 Jefferson Nickel is nearing completion. 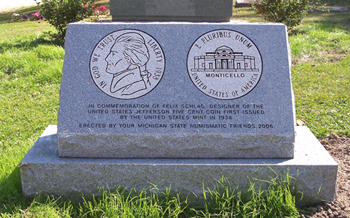 The monument is to be set at the foot of the gravesite of Felix and Ethel Schlag at Oak Hill Cemetery in Owosso, Michigan. The granite marker is of the same granite as the existing headstone, but will include information about the design of the Jefferson Five Cent coin as well as a depiction of both the reverse and obverse of the 1938 (first year issue) Five Cent piece. The marker was also designed by Bieda. "I was somewhat surprised at the number of individuals who have contacted me since I undertook this project," said Bieda, "A large number were long-time or former residents of Owosso, many of whom reported that Felix took either their High School graduation or Marriage photos." One such person is Richard Ball, a colleague of Bieda's in the State House of Representatives. In addition to the special granite marker, new landscaping is planned for the gravesite. Several old yew bushes that were planted in the early 1970s were removed, and the area is being graded and leveled. New landscaping will be installed shortly after the installation of the memorial marker. Any funds remaining after the stone and landscaping is completed will be used for a perpetual maintenance fund and for programs offered by MSNS designed for young numismatists. The idea for the project was initially brought up at an MSNS Board meeting in 2004 by Steve Bieda. It became a collaborative effort with Al Bobrofsky and the two sought the blessing and approval of the Michigan State Numismatic Society in 2004. According to Bieda, "I looked at it as a way of both honoring the designer of one of our most abundantly produced coins, and as a special way of commemorating the fiftieth anniversary of the Michigan State Numismatic Society." Interested parties can make checks payable to: "Al Bobrosky/Schlag Memorial," and sent to Michigan State Numismatic Society, P.O. Box 87931, Canton, MI 48187. Contributions of $25 or more will be recognized with a special certificate.